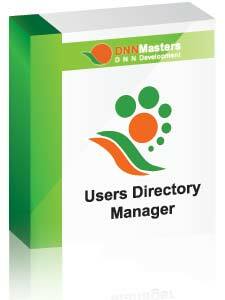 DNNMasters User Directory Manager 5.5 is an advanced module that displays directory of portal users. The module adds three custom profile data types - MyPix, MyAudio and MyVideo - that allow upload and display of images, audio and videos in user profiles and in directory. Directory Manager allows selecting profile fields for display (also custom fields), filtering member list by roles, excluding from display by role, sorting by up to 4 columns, searches and editing account and profile data and export in vCard and Excel formats. Directly email users from directory listing without exposing their email addresses. Integration with DNNFusion My Profile and Data Springs Dynamic Registration. Easy PA installation, no core changes. Version 5.0 brings performance enhancements for searches, optimized administrative options and partially redesigned User Interface. DNNMasters User Directory Manager 5.0 is a powerful package that combines ease of use and the ability to customize the list content, use templates for viewing, edit profile data and display custom profiles. The directory can be sorted and searched by any column and displayed in any layout (HTML Templates). The module interface is clear, intuitive and easy to use. Everything you need is right there at your fingertips. With DNNMasters User Directory Manager 5.0 you can easily display, sort and search a customized directory of your users with few mouse clicks. and a skin object with UDM Search that allows full integration of the directory with portal skins. DNNMasters User Directory Manager 5.0 helps you to display list of selected profiles in a HTML template of your choice, search, display and edit user profile data in a unique way that is comfortable for administrators and beneficent for users. Finding members, viewing and editing their profile data becomes a matter of seconds or minutes, not hours. Membership is a key feature of your Portals and cannot be over valued. A professional, well organized website needs a good membership directory that can increase user satisfaction. Let your users enjoy your portals, not your support. DNNMasters User Directory Manager 5.0 intuitive interface is transparent, straightforward and lets you search, present, export, edit and customize your membership data with ease. Whether you manage a small community portal or a global company's Intranet portal, DNNMasters User Directory Manager 5.0 is the right tool for you. If you really care about your users experience when using your website, DNNMasters User Directory Manager 5.0 is for you. What other tools just promise - DNNMasters User Directory Manager does. It provides you with the right tool to do the job.